>Heat the oil in a small skillet for 2-3 minutes. Add the sliced shallots and fry over low to medium heat, stirring occasionally until the pieces are evenly browned and crisped (may take 10-15 minutes). Drain from oil with a fine wire-mesh strainer. Return oil to skillet and fry the garlic over high heat until golden brown. 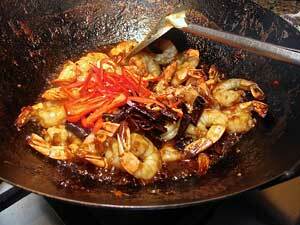 Drain likewise, reserving the oil for stir-frying. 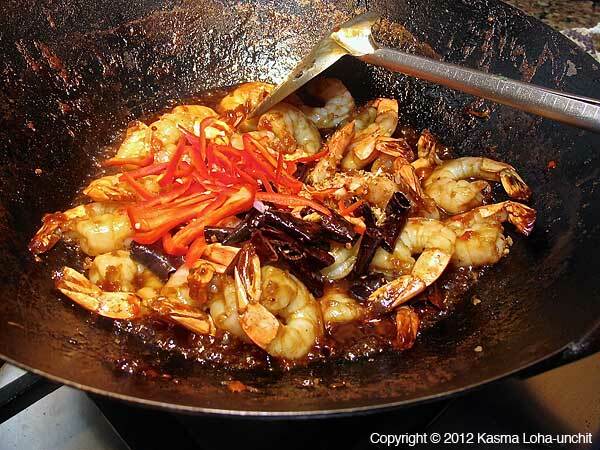 Though tamarind is a souring agent used throughout Thailand, it is favored in the south where it combines with abundant fresh tiger prawns, either farm-raised or fished from the extensive coastal areas of the peninsula, to produce a dish distinctly identified with the region's seafood offerings. The prawns are mildly spiced with a tangy tamarind taste. 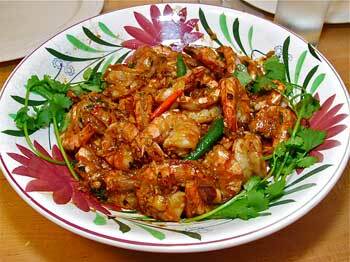 Though the recipe is written for large prawns, it is equally good with smaller shrimp. Adjust the cooking time accordingly. 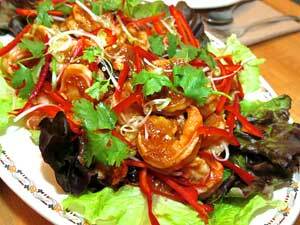 Try it also with squid or a combination of shrimp and squid. Make sure the squid is well drained before stir-frying; squeeze gently to remove all water trapped in the rings so that it does not dilute the sauce. Scallops are also wonderful cooked in this sauce, but dry them well with a towel before adding to the wok. To save yourself the work of crisping shallots and garlic, use pre-packaged products available in small containers or bags from Southeast Asian markets – substitute with 2-3 Tbs. for the shallots and 2 Tbs. for the garlic. (Click here for Kasma's favorite brand.) However, they generally do not taste as fresh. *Because the Thai language has its own script, there are different ways of transliterating Thai into English. The more phonetic version is Gkoong Yai Pad Som Makahm Bpiak; the more usual spelling is Goong Yai Pad Som Makam Piak. See A Note on Thai Pronunciation and Spelling.